I have wrapped these two little spirit bottles with solid copper enamel coated wire (to slow oxidation) and accented them with a shimmering mix of deep sea and azure blue glass marbles just to make sure that the bottles are irresistible to those evil spirits. 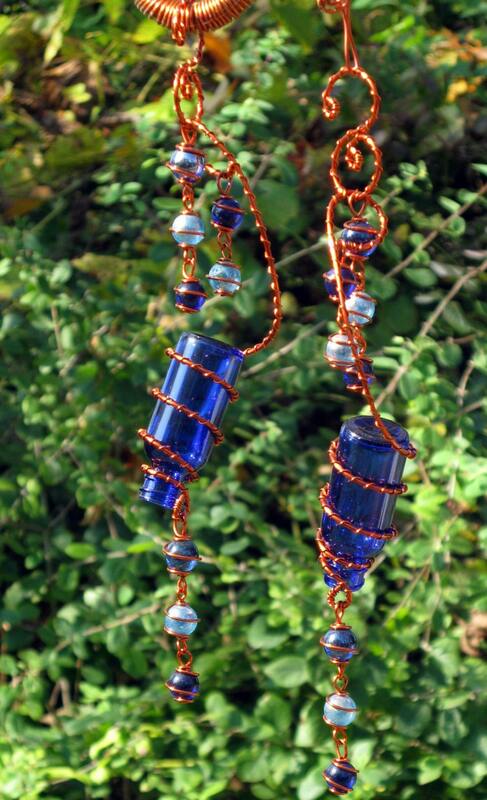 They are each topped with a copper hook and ready to be hung in the tree of your choice. These bottles are ready to ship and will be mailed Priority Mail within one business day of payment. It was shipped in a timely manner and well packaged. Thanks. I was entirely satisfied with my dealings with this shop and was delighted with my purchase. My suncatchers are hanging in a tree in the garden and we are enjoying them. I had wanted a bottle tree for some time - ever since traveling to the South and learning about them - but didn't have a good place in which to put one. These two little suncatchers have served to satisfy that yearning. Love the pieces, love the story...very creative! Great transaction, thank you!